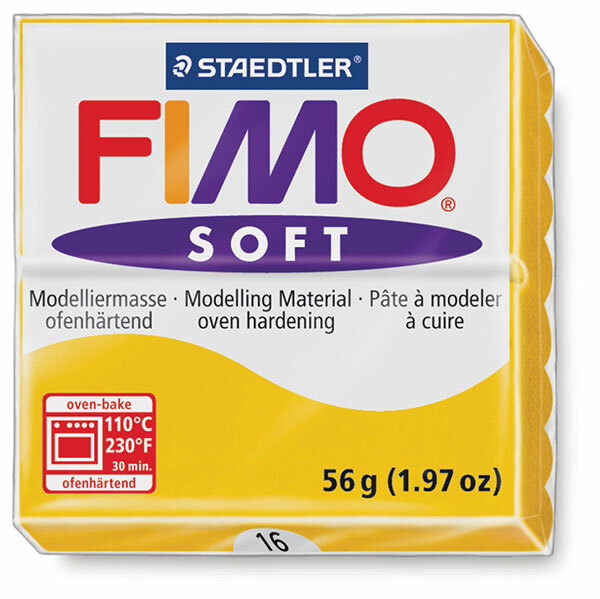 Fimo, the popular polymer clay noted for its firmness, is now available in a softer, easier-to-condition form. The softer formula makes it easier for children to use, though it is still firmer than other brands. Fimo Soft Polymer Clay is available in a variety of bright colors. It's intermixable with Classic Fimo, and like Classic Fimo it hardens in the kitchen oven. Set of 10 — This set contains ten, 1 oz blocks of Fimo Soft. One each of White, Mandarin, Brilliant Blue, Peppermint, Black, Indian Red, Tropical Green, Caramel, Lemon, and Violet. Instructions included. Set of 24 — This set contains twenty-four, 1 oz blocks of Fimo Soft. One each of Lime Green, Cognac, Black, Lavender, Violet, Plum, Windsor Blue, Brilliant Blue, Pacific Blue, Peppermint, White, Nightglow, Lemon, Sunflower, Mandarin, Indian Red, Cherry Red, Raspberry, Tropical Green, Emerald, Caramel, Sahara, Chocolate, Dolphin Grey. Instructions included.